One of the joys of living in the Pacific Northwest is that you can sail year-round—provided, of course, that you’ve got the right boat.  As I approached the Hanse 575 Crescent Wave at Port Sidney Marina in Sidney, British Columbia, I noticed three things: her impressive freeboard; her spacious, teak-clad foredeck; and the 15-knot late-October breeze piping in from the south—the same direction that the tide was draining. 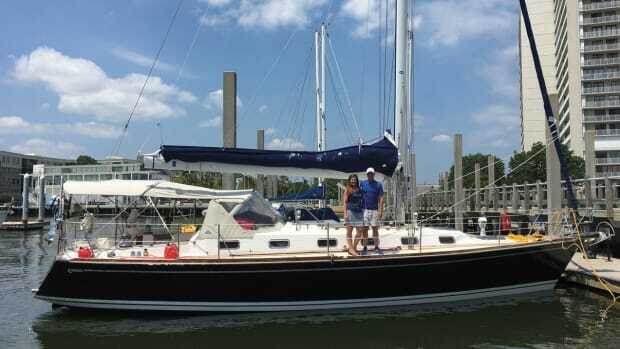 “Not to worry,” said Brian Huse, a broker from nearby Freedom Marine, as we climbed aboard. “She’s a dry boat.” Having logged my share of Northwest winter miles, though, I still donned my bibs and sea boots, just in case. A few minutes later I took the helm while Huse and another member of the crew raised the mainsail—a push-button affair—and unfurled the self-tacking jib. A few more button presses trimmed in the sails, and the next thing I knew Crescent Wave was making 7 to 8 knots toward Sidney Spit before tacking for the Cordova Channel. As she did so, I couldn’t help noticing that—although I was certainly warm—my bibs and boots represented a bit overkill, as I didn’t see a single errant drop tag the cockpit sole. Clearly, I was aboard the right boat for this kind of weather and these kinds of conditions. Add in the boat’s performance-sailing pedigree—which comes gratis the renowned Judel/Vrolijk office—and you have an impressive design, indeed. 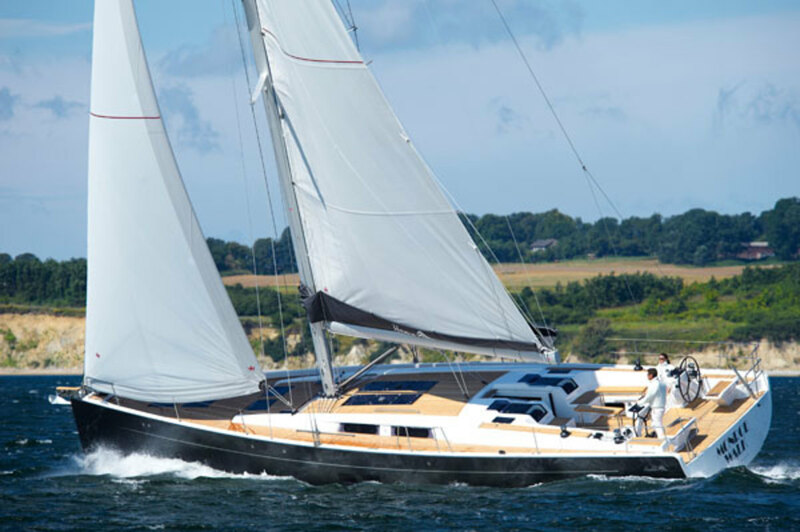 The Hanse 575 is built in Greifswald, Germany, to Germanischer Lloyd SE’s ocean-going classification standards. The GRP hull includes a balsa core and is hand laid using polyester epoxy for all inner laminates and Vinylester resins in all outer laminates to resist blistering, as well as an Isophthalic gelcoat. All bulkheads are laminated to the hull and the deck, while a composite sub-frame adds structural rigidity. The keel is attached using a combination of stainless steel bolts and backing plates. Shoal- and deep-draft versions are available. The deck is balsa-cored and also hand laid with a Vinylester outer layer, and polyester for the majority of its laminate. 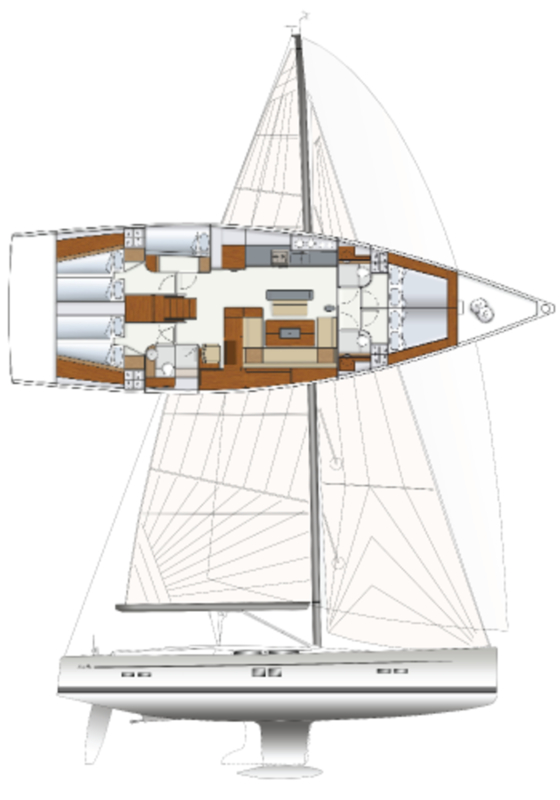 Big teak expanses best describe the Hanse 575’s large and comfortable deck layout. Dual helms (with optional helm seats), a scooped-out cockpit transom, dual retractable cockpit tables (that double as a huge sun-bathing area/abovedecks berth), dual waterproof stowage compartments (either side of the companionway) and a pronounced bulwark that runs from bow to stern are other important on-deck features. The Hanse 575 is equipped with an innovative tender garage (designed for a Williams 2.8 meter jet tender, but capable of accommodating other similar-sized boats) and a hydraulically controlled platform that dips into the water for easy swimmer/tender access. Among the nice touches aboard Crescent Wave were a spacious sail locker, located directly abaft her stem, and a powered windlass. All hatches are flush-deck, making for a clean, aesthetically pleasing deck. A two-spreader, keel-stepped Sparcraft aluminum rig with a self-tacking jib comes standard. Crucial running rigging such as the main halyard, the mainsheet, the jib sheet and the jib-furling line are led aft, via tunnels, to powered winches at each helm. The Hanse 575 is available with no less than six different interior arrangements (one “standard” and five “optional” layouts) to accommodate a wide range of sailors’ particular needs. Our test boat was equipped with a generous V-berth owner’s cabin forward, dual quarter berths, two heads/showers and a bunk-bed cabin that would be great for juniors or single guests. 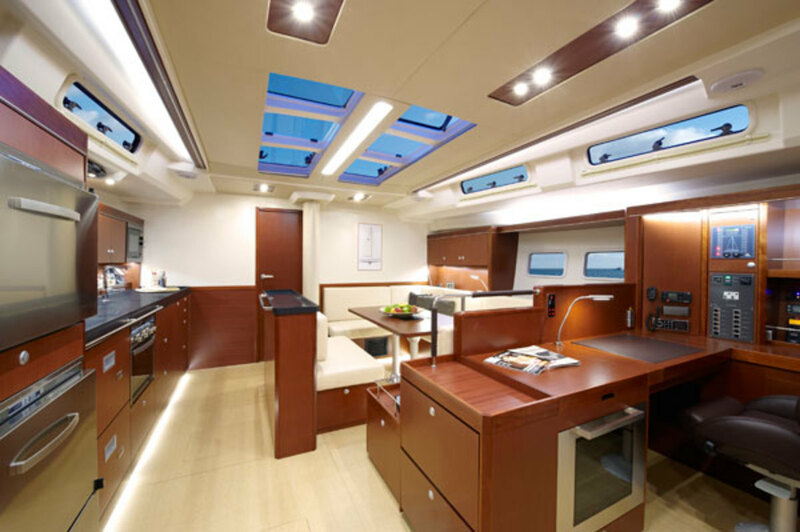 All interior designs feature an open, loft-like aesthetic, with a portside center-ship galley, a large saloon area (with a retractable table that converts to a king-size berth), and forward-facing nav station and desk. 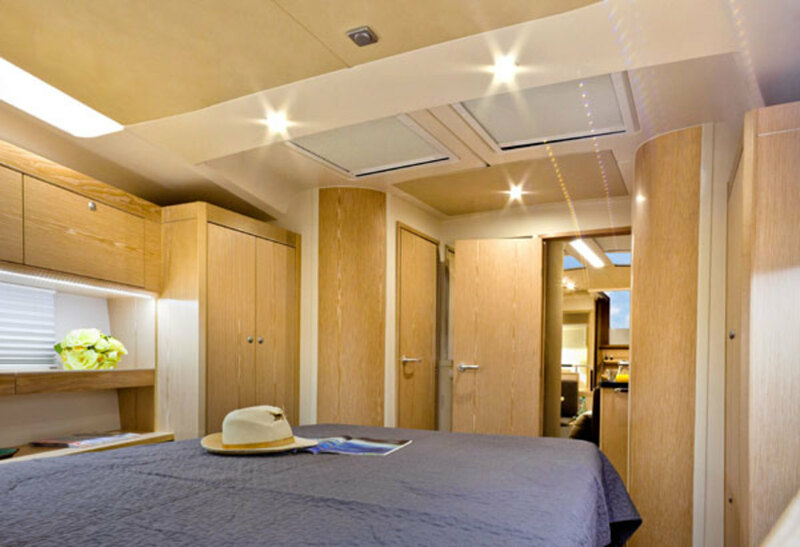 All six layouts are available in a variety of woods and upholsteries styles, and all versions feature plenty of natural lighting (via hull windows and deck-mounted hatches/windows, as well as dimmable LED lighting throughout the vessel). Tall sailors will especially appreciate the interior’s generous headroom, and the boat comes with stepladders for accessing ceiling hatches. 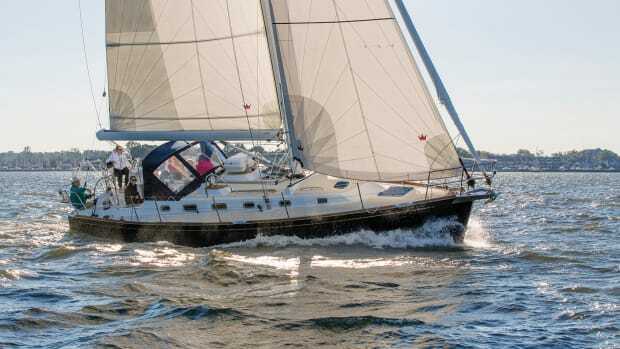 While the Hanse 575 carries a lot of freeboard and interior volume her hull is still gratifyingly slippery, and she had no trouble making 7.8 knots on a beat in 13-15 knots of true wind. Short tacking up the Cordova Channel was a singlehanded affair that simply required stepping from one helm station to the other, thanks to the boat’s high-aspect headsail. The helm felt balanced but a touch stiff in the big puffs, and Huse advised that we were at the crossover between carrying a full main and tucking in a reef. Although the boat is clearly configured to serve as a fully loaded cruiser, she had no trouble quickly covering ground in the small, choppy seas and the cold, late-October air. 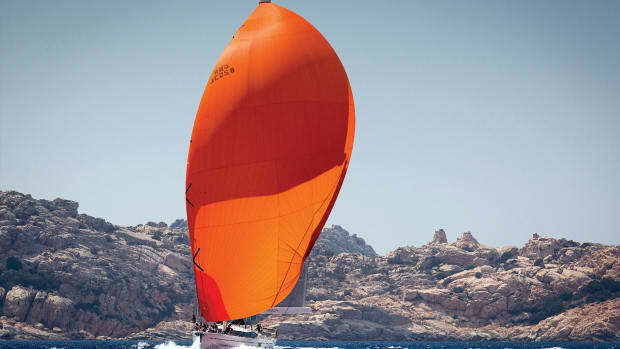 Although the Hanse 575 is configured to carry your choice of reaching sails, Crescent Wave’s wardrobe was limited a jib and main. Nonetheless, running downwind the boat still slide along comfortably at 7-8 knots. Once we cleared Cordova Channel, though, and could heat up our apparent-wind angle, Crescent Wave proved she loves reaching as much as her crew. 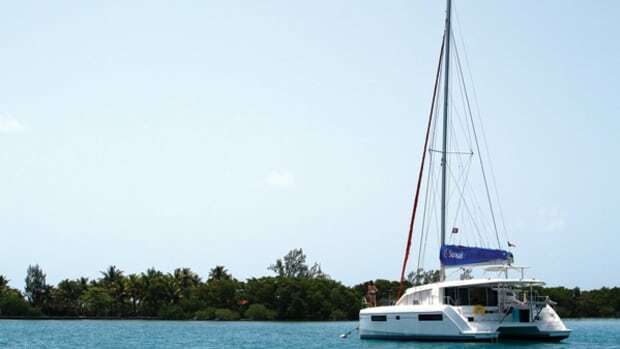 The Hanse 575 is equipped with a Volvo D3-110 shaft-drive diesel engine, with a 150 hp engine available as an option. Retractable thrusters, both bow and stern, are available as options to ease close-quarters maneuvering, which more than proved their worth aboard Crescent Wave as we maneuvered out of her tight slip with ease, despite a stiff crosswind. Revving the auxiliary up to 2,400 rpm, yielded 9 knots of boat speed. The noise and hull vibration were minimal throughout. 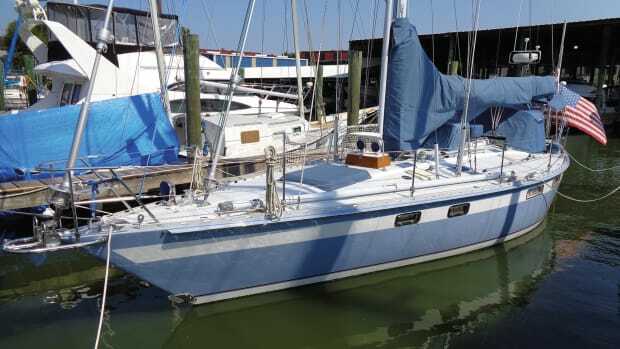 The Hanse 575 could be a great cruising boat for owners who are interested in a wide variety of sailing, from fun-minded transoceanic cruising rallies to coastal-cruising adventures with family and friends. 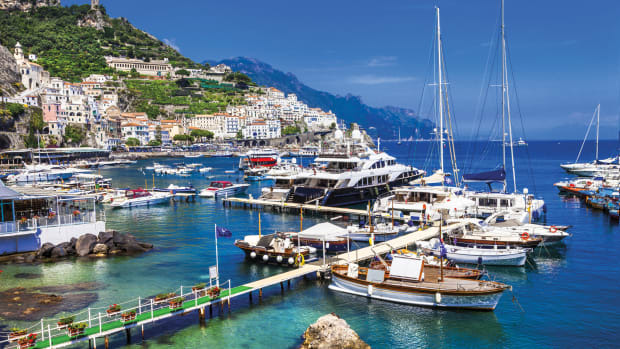 The boat has no trouble accommodating two or three couples and their children, yet one or two capable sailors can easily handle the boat in almost any condition. 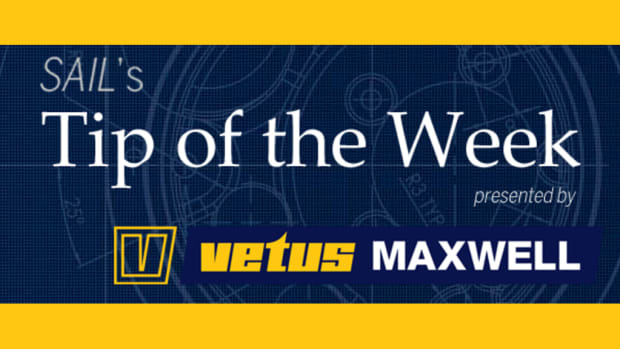 Build quality is solid, and the boat’s clean deck layout, its contemporary design and its slippery, performance-minded sailing characteristics should make this a popular design.